I pulled the recipe for this plum cake out of a manila folder I keep that's bursting with clippings and marked "very good." The thought that a recipe given such high marks can be so poorly filed is sad...but I'm on my way to changing that! I remember running across this one in a magazine (can't remember which one) and racing to scribble it on a small scrap of paper I had at the bottom of my purse, hoping I'd get it all down before it was my turn in the dentist's chair. Though our dentist is amazing, he runs far too tight of a ship for an office that actually has magazines worth reading. As a result of this office's efficiency, I knew that I wasn't complete in noting all the parts of this tasty little cake...later marking the scrap of paper with a note to such. It came out really well the first time but it was lacking something. With a little tweaking here and there (looking at a few other "upside down cake" recipes), I came up with this and, truly, it's very good. Apart from the fact that the plums are terrific right now (especially these black ones with the brilliant red flesh), the cake is very light and moist, without being spongy or wet. And the addition of a little almond extract just enhances the whole flavor. Top it all off with a dollop of fresh whipped cream and a sprinkle of sliced, toasted almonds and it makes a nice little presentation. 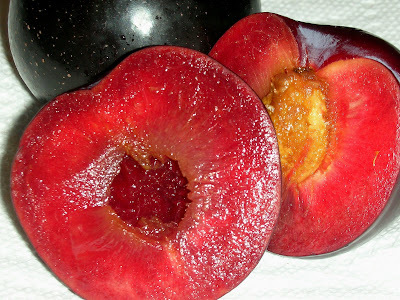 Though I think most any plum would work for this cake, I especially like these black plums which give a fairly intense reddish-pink hue when baked up. 2. Cook 4 tablespoons butter (1/4 cup) and brown sugar in a large skillet over medium heat until butter melts, about 2-3 minutes. Add sliced plums and cook for another 1-2 minutes. Remove from heat. 3. 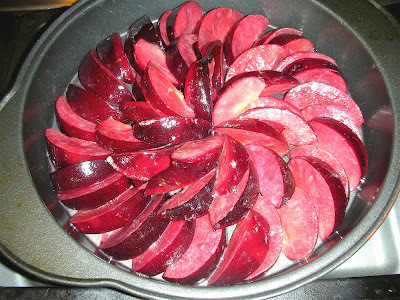 In a 9" round baking pan, arrange plums in concentric circles (starting at outer edge of pan and working inward) and then spoon juices from skillet over fruit. Set aside. 4. Whisk flour, baking powder, baking soda and salt in a medium bowl. Set aside. 5. In a separate bowl, beat remaining 1/2 cup butter (1 stick) and sugar until fluffy. Beat in egg, milk, sour cream, almond extract and vanilla extract, until mixed. Gradually add flour mixture in until fully incorporated. 6. Pour batter over plums and bake in a 350 degree oven for 50-55 minutes, until a toothpick comes out clean. Let cake cool for 1 hour before removing from pan. After 1 hour, carefully place cake platter inverted over cooled cake pan. Hold both platter and pan securely and carefully flip both over so that cake platter rests on counter top. 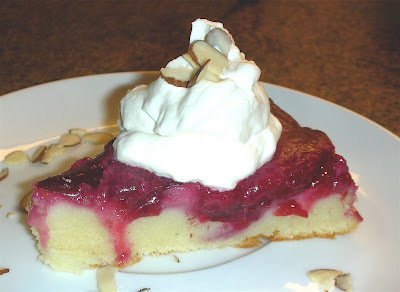 Carefully remove inverted can pan from cake, exposing plum arrangement on top. Serve with fresh whipped cream and sprinkle of sliced, toasted almonds.